The temporary provision that allowed planning permissions in existence on the 1st October 2009 to be extended for a further 3 years has been extended again. The latest move, confirmed by the Government, means that a further one year extension will apply to planning permissions granted on or before 1st October 2010. We welcome this move as it will allow those with existing planning permissions to apply for a time extension, rather than submitting a fresh application. It is another measure to get the country building by keeping supplementary costs such as planning to a minimum. The popularity of using timber as an exterior cladding material is increasing and this measure should give a boost to building and refurbishment projects. 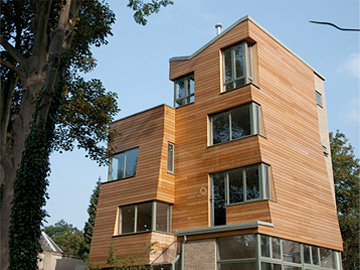 We have recently supplied both cedar and larch cladding, treated and untreated, to projects ranging from new supermarkets and refurbished high street stores, through to new residential projects and householder extensions.